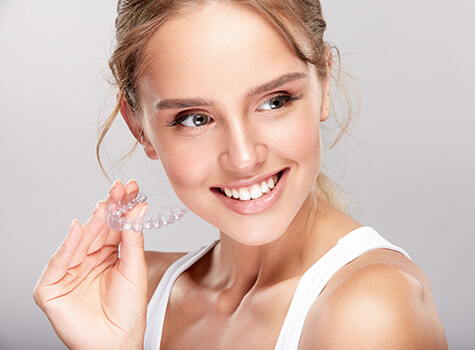 The increasing demand for aesthetic orthodontic treatments for improved appearance and oral function has made clear aligners therapy one of the most popular and preferred techniques for both teens and adults who want a straighter smile without the hassles of unsightly brackets and wires. Custom fabricated to guide your teeth into their proper positions, clear aligners are a more aesthetic orthodontic alternative but, without metal wires and brackets. Clear aligners comprise a series of invisible trays that gently move your teeth at small intervals without employing any obvious apparatus. Apart from being transparent, they fit seamlessly on your teeth, which is why they are hailed as, ‘undetectable braces’. Invisalign® is a type of clear aligner, offering the flexibility, comfort, convenience and aesthetic value that orthodontic patients look for. This virtually unnoticeable option is perfect for those who want to correct their smile secretly. Invisalign efficiently corrects widely spaced teeth and overcrowding to give patients a visually appealing outcome. Invisalign® is a great option for teens who want to change the appearance of their teeth without making it apparent. In addition to eliminating the hassles of brackets and wires, Invisalign® efficiently straightens teeth in less than half the time that traditional braces take without imposing any food restrictions. ClearCorrect is an invisible, removable clear aligner that is customized to apply gentle pressure to your teeth, moving them gradually and correcting their position aesthetically for a pleasing outcome. These clear aligners are completely undetectable and much more discreet as compared to traditional braces. The cost of clear aligners depends on the severity of your misalignment and your location. The entire treatment approach is tailored to cater to unique patient needs and so, the treatment cost varies from patient to patient. However, the cost of clear aligners is higher as compared to traditional braces but is totally worth it when compared to the confidence it brings you! At Putnam Orthodontics, we don’t want that obtaining a healthy, beautiful smile becomes a cause of financial worry for you and that is why we pride ourselves on providing flexible and affordable orthodontic services. How Should You Care for Your Clear Aligners? Wear them for at least 22 hours every day for two weeks before you can switch to the next set. Carefully remove your aligners when you eat or drink. Avoid hot drinks as they can cause your clear aligners to deform and stain. Clear aligners can be conveniently removed for brushing and flossing. They are easy to clean and care for. 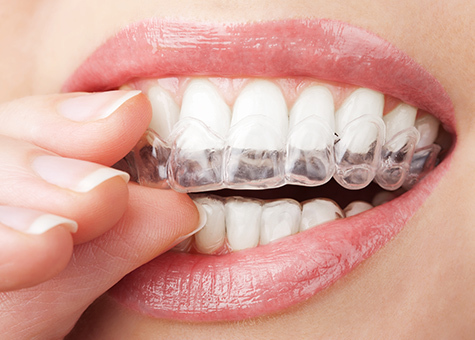 Clear aligners are comfortable to wear and less likely to irritate your teeth and gums. Clear aligners are virtually invisible, allowing people to smile with confidence. With clear aligners, there are no constraints on the foods you can consume. They significantly reduce the risk of enamel decalcification which usually occurs due to brackets. Step 1 – The Patient’s dental radiographs and digital scans are taken to arrive at an accurate diagnosis. Step 2 – Based on the diagnosis, Dr. Pai formulates a customized orthodontic treatment plan. Step 3 – The treatment is initiated accordingly and follows the predetermined course for the best results. Step 4 – Once the best treatment plan is initialized in the CAD application, the movement of every tooth is meticulously sequenced for each individual stage. Step 5 – Highly accurate 3D printing technology is employed for fabricating horseshoe-shaped models for every stage of tooth movement. Step 6 – Custom-tailored clear aligners are then given to the patients to be worn for 2 weeks at a time. 3D printing has opened a new realm of possibilities in orthodontics for patients with special needs. The entire process is seamless, takes much less time and reduces the need for repeat appointments. 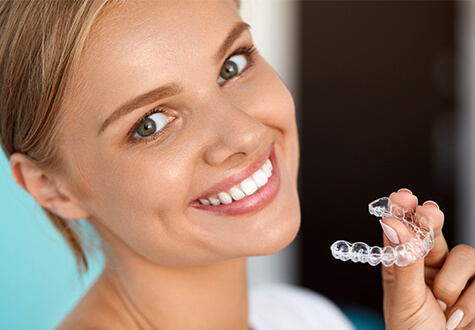 Get a better, beautiful smile with clear aligners and feel confident! Visit our Carmel or Briarcliff Manor dental clinic today to ensure a lifetime of straight smile without any brackets, wires or interruptions.